Wild leeks (Allium tricoccum) are an early spring delicacy for foragers. Clip the top greens only for sustainable harvesting. An early spring ephemeral, the wild leek—or ramps—is an aromatic, delicious wild onion. The bulb sweetens when roasted, pickles well for martinis, and has tops that are delicious as garnish or incorporated into a spring salad. While they may seem to carpet the floor of the woods in the spring, there is growing concern for overharvesting wild leeks for the restaurant market and by hobby foragers. Regionally, wild leeks are distributed as far east as New York State and through Canada, west into the forests of Wisconsin and Minnesota, and south into Appalachia. Wild leeks are plentiful in the well-drained soil of beech and maple hardwood forests along rivers and on the back dunes along the Great Lakes shoreline. The broad leaves of the wild leek are frequently found alongside unfolding mayapples and trout lily. Recently, the wild leek (Allium tricoccum) has been the forager’s darling, showing up on menus and in farmers’ markets. This increase in popularity is putting pressure on the wild leek population along the East Coast and has the potential to do so in the Midwest. It takes about three years for a seed to develop into a mature leek ready for harvest—a long time! It takes about 18 months for a ramp seed to germinate, and another two years for that seed to grow into a small bulb** that sprouts two broad, smooth leaves of about 6 to 8 inches in length and 2 to 3 inches across. A sizable, mature bulb should be at least 3 years old or more. In midsummer, the plant sends up a flower stalk with a white flower cluster which then bears small, round 1/8-inch seeds. But harvest with care: recent popularity has threatened it. The bulbs can be easily dug with a garden fork, but only harvest the full plant in moderation. The most sustainable way to enjoy the wild leek is to only clip the tops for use in cooking. Take time to first learn the distribution of leeks in the area before harvesting, and chose to harvest tops only. Transplanting wild bulbs within the wild can help expand stands of the plant. Also, local growers are beginning to propagate the wild leeks for private forest gardens, making this a sustainable option for the forager wishing to enjoy the bulbs in the early spring. I won’t lie: I really love ramps. But unless we take some pressure off of the wild plant populations, we will ensure their demise. Helping ensure a good foraging ethic is an important part of cultivating a sustainable local food system. To that end, cultivate your own stands of wild leeks to ensure a small harvest each year. Be sure to inquire at markets and at restaurants as to the forager’s sourcing and practices in gathering the wild leeks. In doing so, you can enjoy this delicious spring vegetable and help ensure patches of leeks in the wild can also be enjoyed by future generations. For a more information on sustainable harvesting of wild leeks, view this recent article in Epicurious. The wild leek is a early spring bulb that is markedly oniony in both flavor and scent. 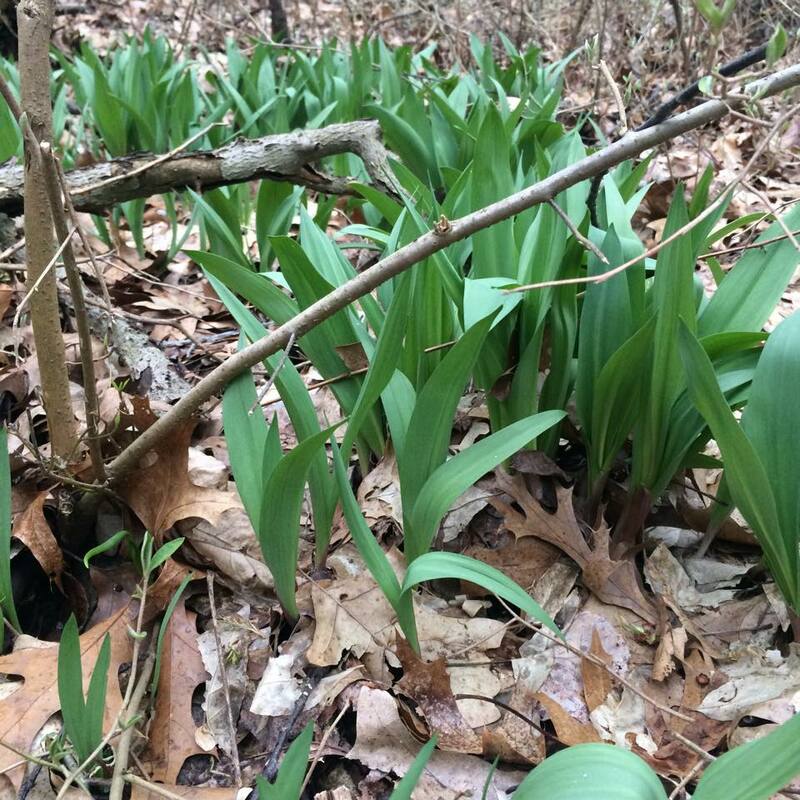 This early spring food could easily be mistaken with the false hellebore and lily of the valley, both of which are poisonous and neither of which smells or tastes like onion. If in doubt, scratch and sniff. Too many people are over harvesting wild leeks in the parks of Grand Rapids. It is illegal to remove plants without permission. I watched several people do it yesterday in a unnamed park. I am not mad and won’t report it unless it gets out of control. However, you cannot clear an entire area of them. Plus too many do not pull up the plant correctly and leave a ton of leaves laying around. It is sad because it can wipe out and entire park. Wild leeks are native and very important to healthy soil, food for animals, and stormwater runoff. Please go after garlic mustard. It is so destructive to the native plants including wild leeks. They will kill wild leeks and other off easily. I do recommend if you witness removal of plant material on park land that it should be reported. It is illegal, and it is our responsibilty to ensure a foraging ethic as part of our local food system. Thank You for posting an article like this.